"Shrouded in myth is the life of King Arthur himself. Long praised as the noble king that brought a period of light to the dark ages." A few years back, Leonard Nimoy began hosting a short-lived, but fascinating, television series entitled Ancient Mysteries. The series was much like the classic In Search Of, but had the advantage of using modern theories and science to examine all sorts of unusual subjects from around the world, from UFOs to Bigfoot. 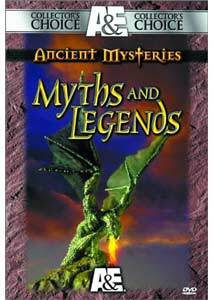 Coming to DVD in select volumes, this first edition examines some of the more popular "Myths and Legends" of our time, compiling various opinions and theories on them, and attempting to offer some answers. Ancient Mysteries abandons the hokey attitude of similar shows and is far more credible and professional in it's attitude towards these classic, baffling mysteries of ancient times. The first 45-minute episode is entitled Camelot, and as you might guess, it discusses the possibility that King Arthur's legendary community of wisdom, science, and magic actually might have once existed. We all know the classic story of his giant castle of silver and gold, but is there any factual evidence that the Camelot of lore really existed? After all, for decades people thought that the city of Troy was entirely fictional until it was actually found. You'd be surprised at some of the pointers that, indeed, Arthur may well have been one of Britain's most enlightened rulers. Many modern ideas are passed back and forth, possibly offering some truth to the myths. Next up is The Quest For The Holy Grail, which discusses the endless search for the cup that Jesus Christ drank from at his final meal. It probably stands as one of the most enduring, legendary artifacts, but yet are we really any closer to understanding it? I actually have been fascinated with Grail-lore for some time, and have read a few books on the subject. I was impressed that this episode presented some of the most informed and modern theories about the Holy Grail; indeed the fact that it may not have ever existed, but was rather a Christian interpretation of even more ancient symbols. It even offers the controversial theory of the Grail as a metaphor for Christ's bloodline, which extends to this day. In Atlantis: The Lost Civilization, the lost culture of Atlantis is examined. For a long time, Atlantis has seemed like a ridiculous, fanciful myth, but when you look at a lot of the current, modern evidence, Atlantis does not seem quite so. Again, this is a topic I've read a lot on, and this episode did not disappoint me in terms of its knowledge. It presents most of the modern ideas (with the exception of some of the absolute newest) in a very mature way. There are definite clues that at some point, and island civilization may once have existed, but was dispersed around the world after a great natural disaster. While Atlantis has incorrectly been exaggerated in fiction as a place of magic, laser beams, and spaceships, the real meat of the physical evidence points to an advanced, organized culture that may very well have blended into Greek and Roman culture. In Dragons, the idea that dragons may have been real creatures is offered. Again, topics like these must properly separate exaggerated legend from fact, and this episode does a good job. It offers the idea that giant, fire-breathing lizards may have NOT existed, but certainly giant lizards of some sort may have given rise to the myths. Cryptozoology is always digging up new clues about possible links between unknown animals of the past and animals of the present, so it stands to reason that, perhaps, anything is possible. Ancient Mysteries (which still plays now and then on the History Channel) is probably one of the best, ongoing investigations of unusual science. It lacks all of the exploitative elements that similar shows have, lending it an air of integrity. There's no cheesy theatrics like Leonard Nimoy emerging from fog, it just offers the theories and evidence in a very serious Nova-like way. Certainly, things are livened up a bit with re-enactments and some showmanship, but none of it threatens the core of the material. It is about time these subjects were treated respectfully and seriously. The world is filled with incredible things that defy conventional or easy explanation, and anyone who devotes their life to unraveling them, certainly deserves some credit. I've long been of the opinion that too much about human history is simply accepted, and it's time we started reexamining a few things. A good place to start is by getting the average television viewer to ask some questions, and encourage them in a spirited, earnest way. This series fills that niche well. Image Transfer Review: Separated onto two discs, all four episodes have excellent image quality. The shows are all very clean (no damage), and lack any kind of significant digital flaws. On occasion, the quality lowers a bit, but it's usually dependant on the quality of the video being used to record certain interviews or other material. There are some videotape errors, but nothing major. Audio Transfer Review: Most of Ancient Mysteries is dialogue from narration or interviews, which is rooted in the center channel. This all comes across with great quality and no complaints. The musical score is stereo, and also works well. The balance between music volume and dialogue is wisely kept in check, and the music never drowns out important speech. Extras Review: There aren't really any supplements to speak of. I suppose the discs should have had subtitles given their educational nature, and a bibliography of good books to read on the subjects would have been nice. There are no inserts (other than an advertisement for other A&E Collectors Series packs), and the general presentation isn't much more than adequate. If A&E keeps up with DVDs for the entire Ancient Mysteries series, it will make an impressive collection of alternate theories and histories for many unsolved, worldy quandries. They certainly make worthy rentals for those interested in the subjects, and probably good purchases for teachers or anyone that want to offer people a little more than just what's in the textbooks.